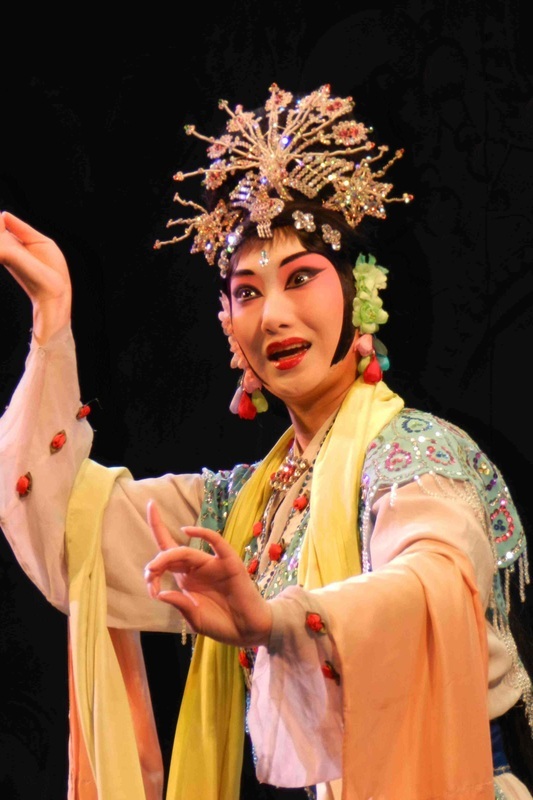 Costumes of performers in the Beijing Opera are bright and the make-up, highly stylized. Though the music sounds strange to western ears, it was a most entertaining evening. 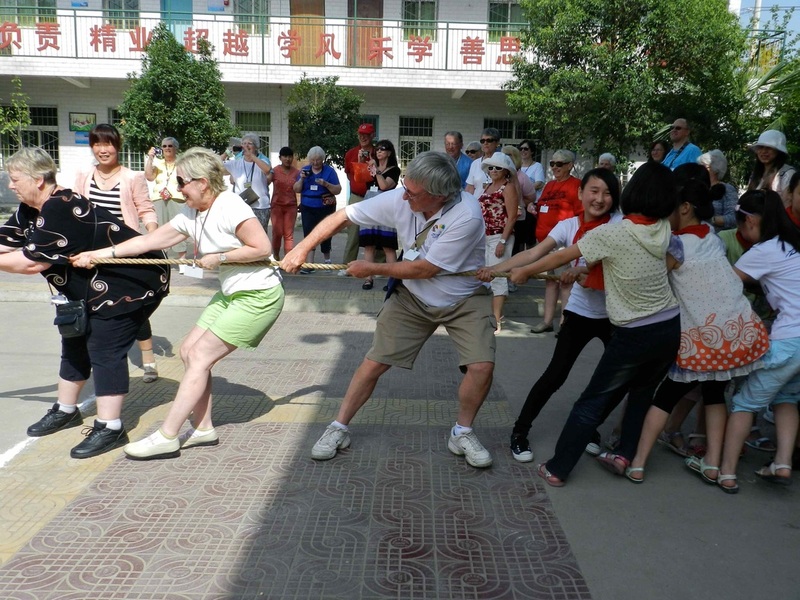 Some of our group help the girls beat the boys in a tug of war after classes at the elementary school we visited near Xian. China: The Great Wall, the Forbidden City, Tiananmen Square, pagodas and dynasties and the Three Gorges Dam, thousands of years of history. These are what usually come to mind when we think of that powerful, sprawling country. But after three weeks in that diverse land, I found myself struggling to capture anything approaching the essence of the place or the experience of being there. 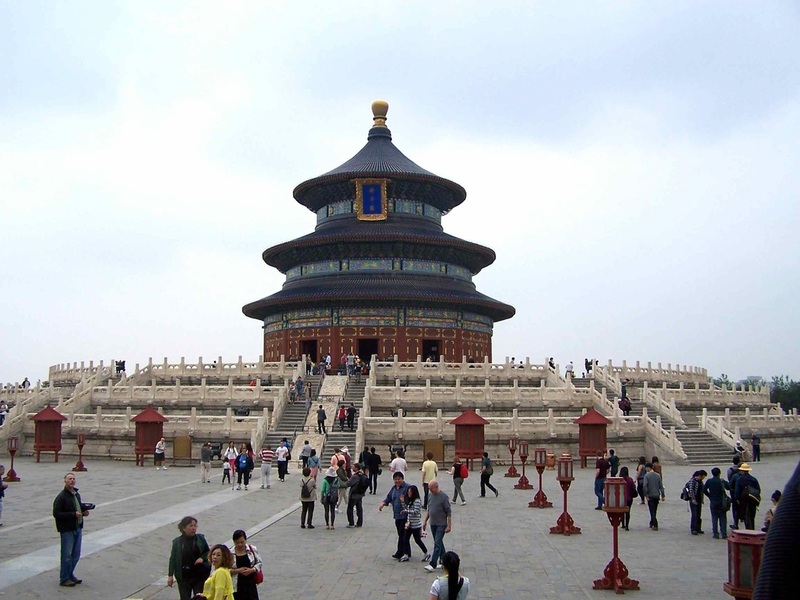 The Temple of Heaven: built in the early 15th century, the structure was a prayer site for emperors following the teachings of Confucianism, Taoism, and Buddhism. An elderly musician plays a traditional instrument in the gardens leading to the Temple of Heaven. Four of us—Wanda and Lew (my sister and brother-in-law), my traveling companion Bob, and I—began planning this trip several months in advance. We met in Seattle for the flight to Beijing where, landing in the middle of the night, we were greeted by Allen, our ever-cheerful leader from Grand Circle Travel, and a happy band of fellow travelers. 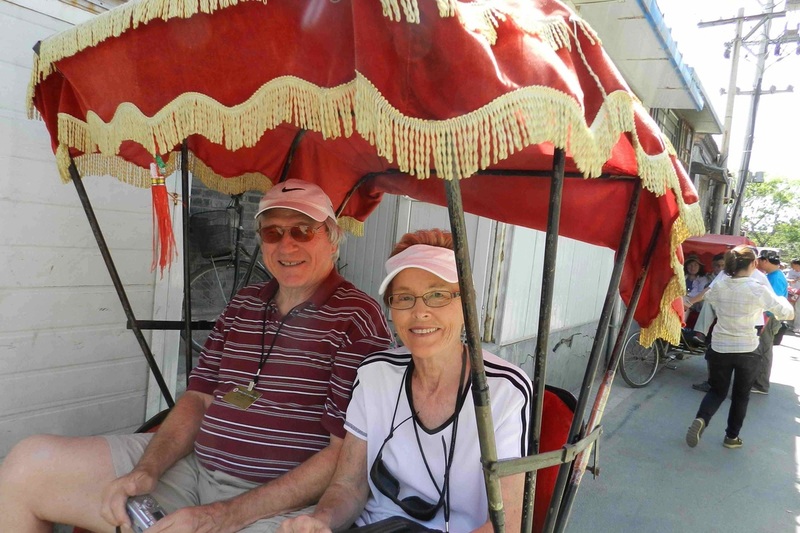 Our three-week tour took us from Beijing to Shanghai, Xi’an, Guilin, and Hong Kong with a welcome respite from crowded cities when we cruised the Yangtze for four days midway through the trip. I had visited the Beijing area briefly in early 1999, a few months before the opening of the airport’s modern Terminal 2. I knew I would see a far different country 14 years later and, indeed, I did. At the time of the earlier visit, the airport was served only by a tired, gritty, jam-packed Terminal 1 (since rehabbed), where airline personnel teetered on ladders to hang metal signs announcing the flight currently being served at each counter. In contrast, the current terminals (there are now three) are as gleaming, modern and automated as any in the world. 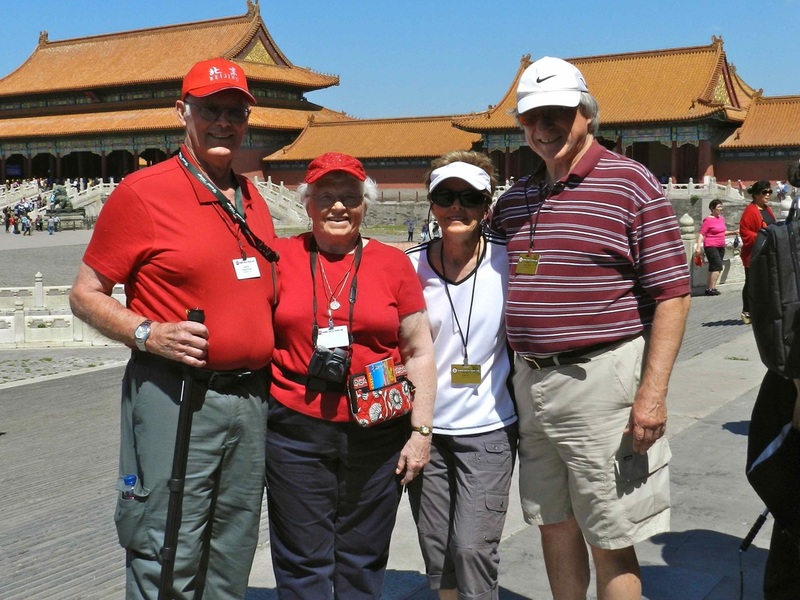 The four of us in the Forbidden City: left to right, Lew, Wanda, Marj, and Bob. Built atop seven layers of brick to foil would-be tunnelers, the City was opened to the public in 1949. 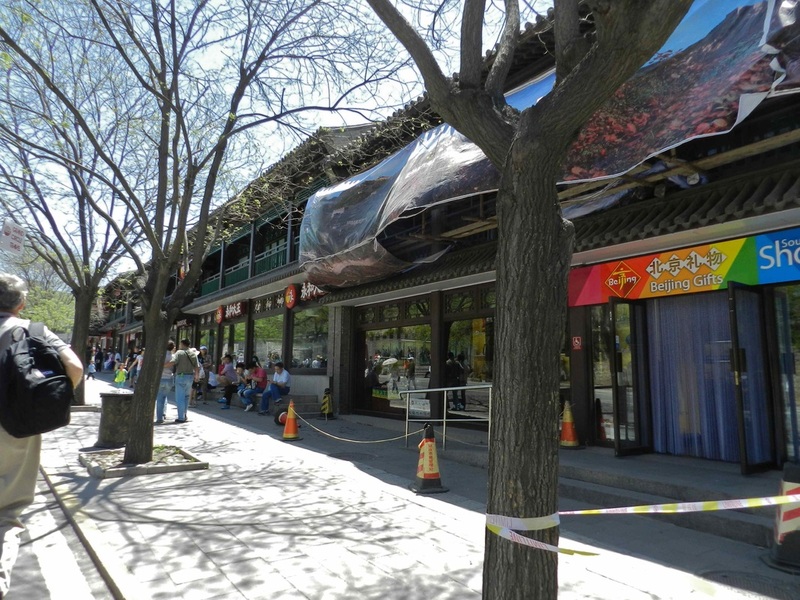 Shops along the street leading to the entrance to the Badaling section of the Great Wall. 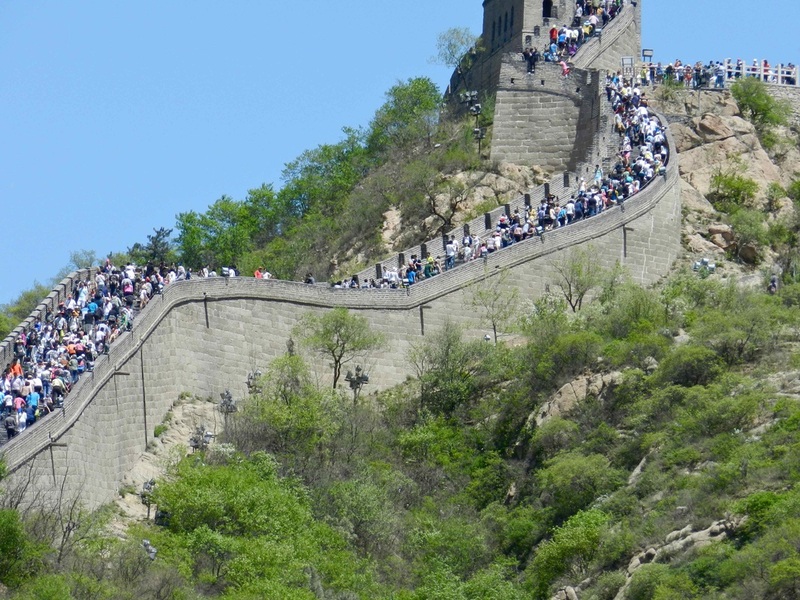 Crowds trudge along the restored section of the Great Wall on a busy day at Badaling. While I was not surprised by the airport, I wasn’t prepared for the changes I found a couple of days later when we visited the Badaling section of the Great Wall. No, the wall hadn’t changed, though I think it had, in fact, had a bit of a facelift. However, the road leading to the entry gate which, if memory serves (and I can’t guarantee that), in 1999 boasted only a lonely tourist center and sparsely stocked souvenir shop, had morphed into a bustling pedestrian mall with a Subway, KFC, something called The Gift Shop in the Great Wall, the Badaling Hotel (with huge souvenir shop and spacious cafeteria), and many more. Walking on the wall was more of a challenge this trip than last, not so much because of the characteristics of the wall itself (and it is extremely steep in parts) or even because my body was 14 years older, but because of the hordes of visitors. This, too, was different; in 1999, visitors were far fewer, partly attributable to the fact that the earlier visit was during a very cold April whereas this time we had shirtsleeve weather, but also due to the fact that the Chinese themselves are traveling more now than in those earlier days and the Great Wall is a must-see destination. We soon found ourselves resorting to what our guide had told us was the Chinese way: When stuck in tight quarters, push! Everything about the Beijing Opera was stylized, even the pouring of the tea, served before the performance. In large cities, in fact, “pushers” (no, not the drug kind) are employed to shove riders onto buses and subways in order to maximize the number of passengers that can be accommodated during morning and evening rush hours! No place for the faint of heart or claustrophobic! 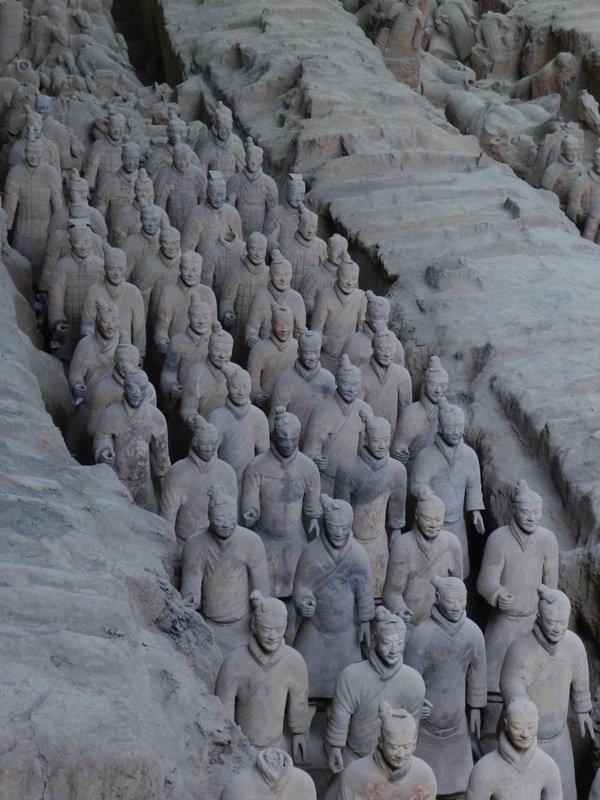 One of the most striking aspects of Chinese cities is the mass of humanity packed within. Most live in bulky high-rise structures packed so closely that from a distance there seems to be no space between them. With few exceptions utilitarian and non-descript, their major adornment is provided by the ever-present laundry hung to dry in windows or small glassed-in balconies. Gone are most of the traditional hutong neighborhoods of one-story buildings—both residential and commercial, often grouped around courtyards and separated by narrow alleyways. 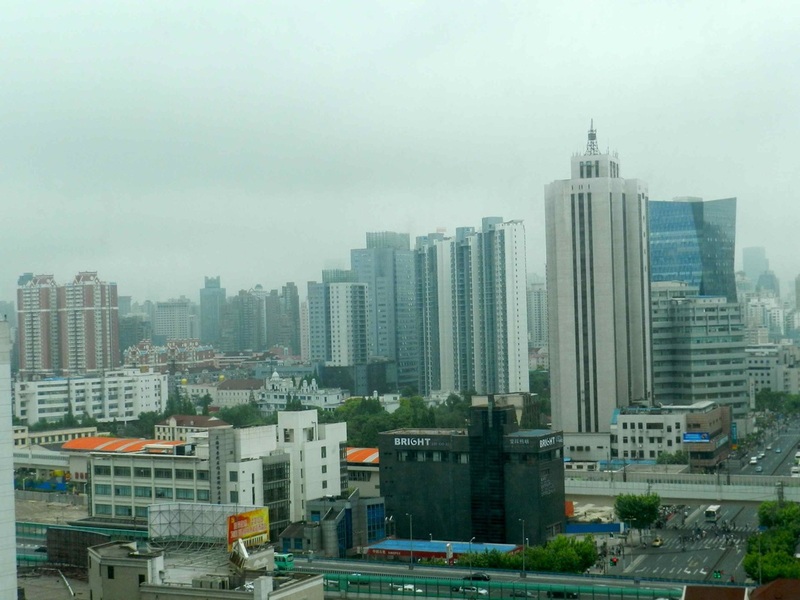 On my earlier visit, my hotel room in downtown Beijing overlooked a hutong and I had enjoyed watching it come to life in the early mornings. Now, more than two-thirds of these neighborhoods have been destroyed, torn down to make room for the high-rises that provide living space for the cities’ burgeoning populations. On this trip, our hotel window overlooked two rows of mid-rise (14-story) apartment buildings separated by a park-like mall, the entire complex about a quarter of a mile long. Apartment complex across the street from our Beijing hotel. Waiting for our pedicab driver to take us to Mrs. Wang's. Drinking tea in Mrs. Wang's small home. 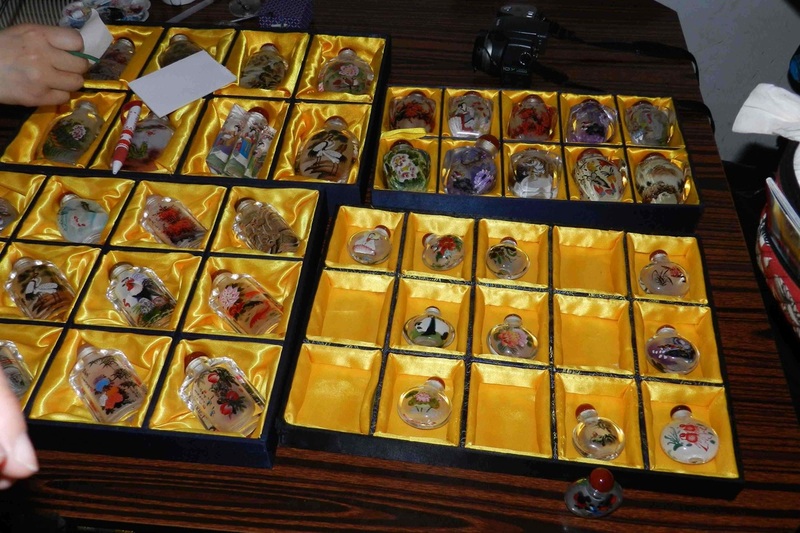 Some of her beautiful snuff bottles. Some things, however, are truly universal. Early one evening, the shouts and cheers of kids at play on the street below drifted up to our 12th floor room. Those sounds are the same, whether they come from the streets of Beijing or San Diego—kids doing what they do best. It felt like home. 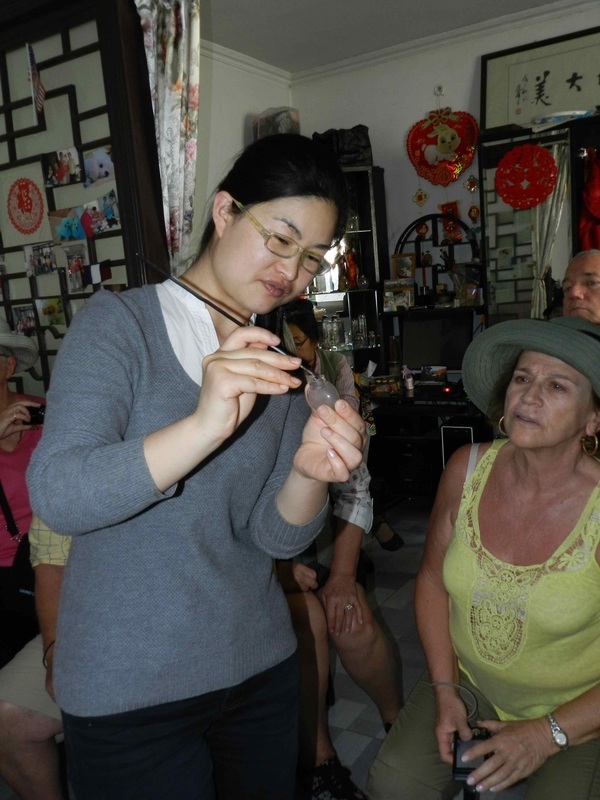 Soon we got an even closer look at Chinese life as we were invited into their dwellings. 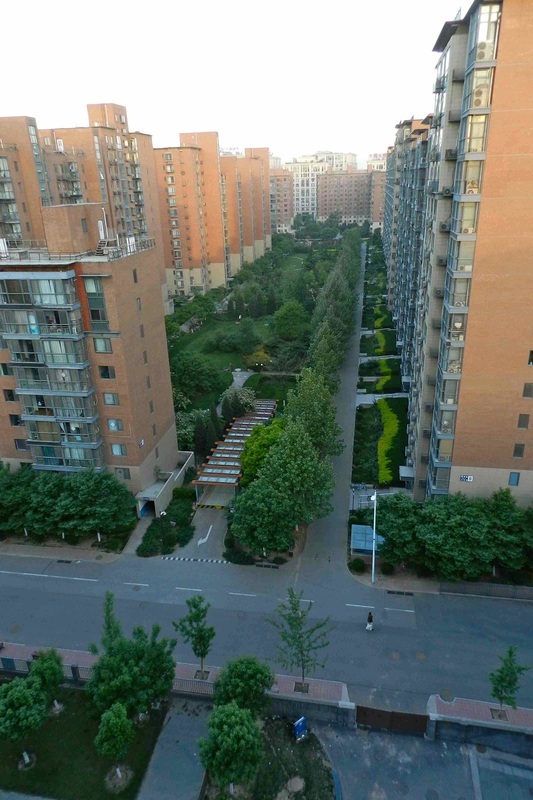 That’s when the buildings, whether high-rises or hutongs, became not sites waiting for us to snap a picture, but places where real people live out real lives. 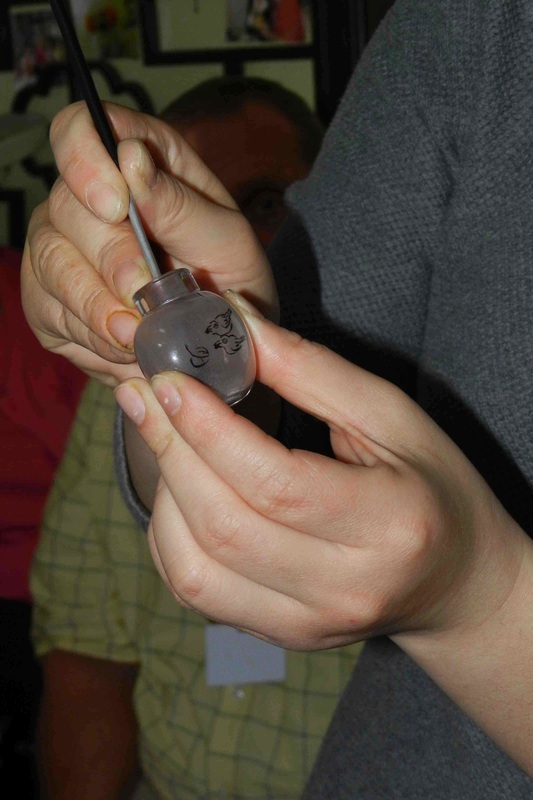 In a Beijing hutong, we were greeted by the soft-spoken Mrs. Wang, a well-known artist who paints delicate watercolor scenes inside tiny snuff bottles. She demonstrated her art and, with the help of a friend, served tea to all 30 of us in her tiny spotless home. 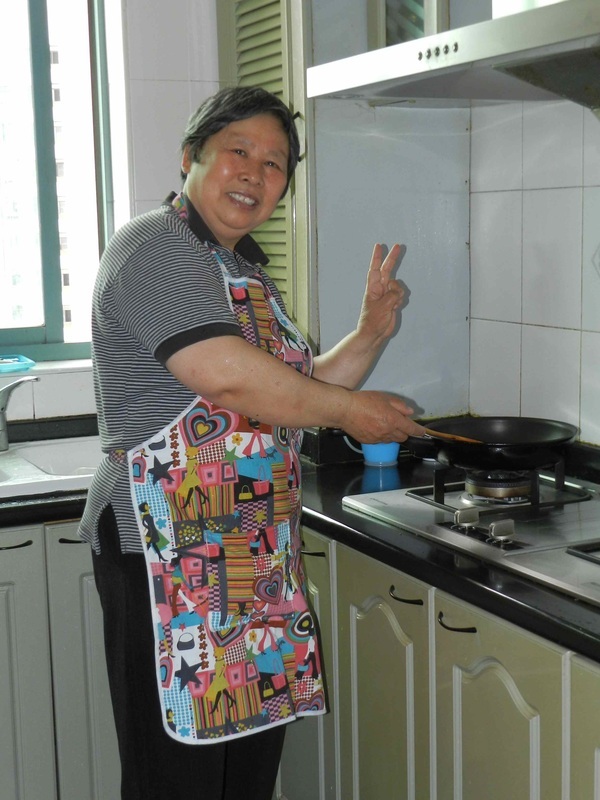 Mrs. Wang paints, lives, and sleeps in what is essentially just one room with a small kitchen adjoining (hutong dwellings have no bathrooms and residents use community facilities located throughout the neighborhood) and is teaching her art to her six-year-old son. Mrs. Wang demonstrates her art. 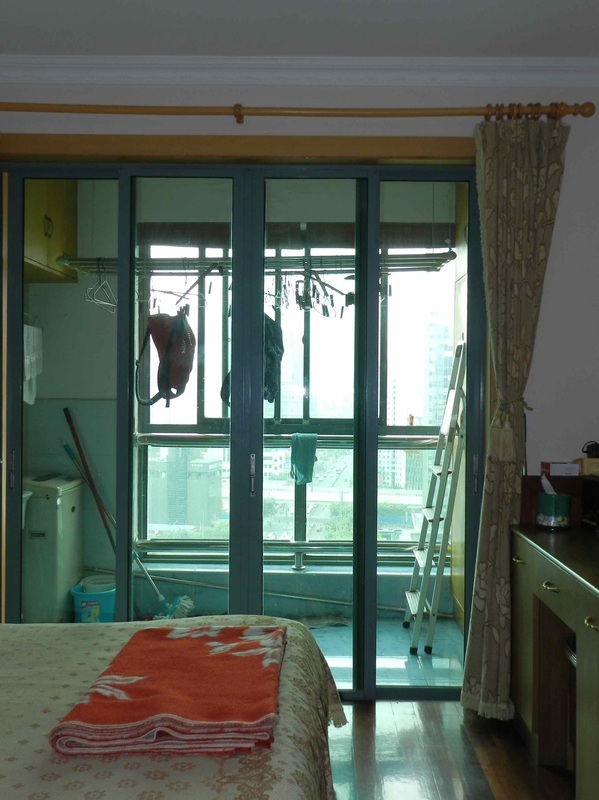 Our second home visit, this time in Shanghai, was very different. 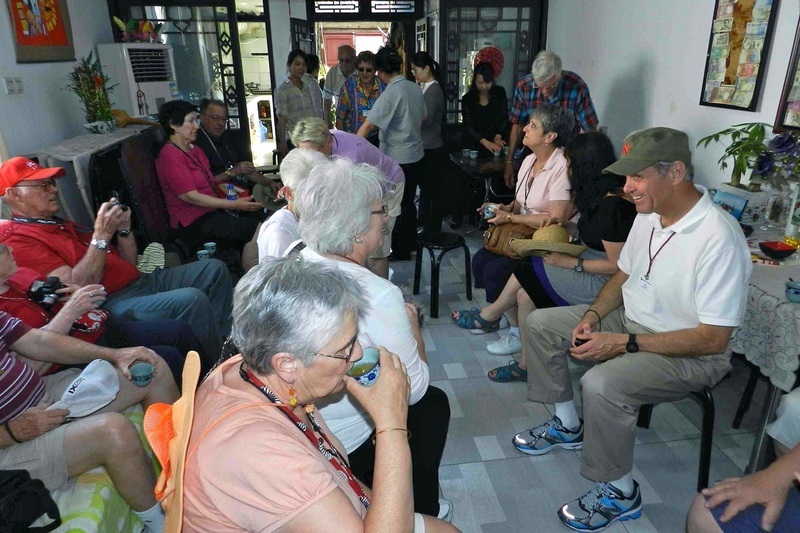 Having divided into smaller groups for our visit, eight of us went with an interpreter to the apartment of Mr. and Mrs. Sol on the 16th-floor of a 40-story high-rise. For the first time, we were able to get a sense of “home” within what outwardly appeared to be just another monolithic and not-very-inviting structure. The Sols, faces wreathed in smiles, greeted us warmly, invited us to look around their two-bedroom apartment, showed us mementoes of previous American guests, and served us the most elaborate home-cooked lunch I’ve ever had: glazed peanuts, cucumbers, tofu with carrots, chicken, eggs, beans and onions, wintermelon (yes, that’s right wintermelon) soaked in orange juice and, at the end of the meal, watermelon, the traditional Chinese conclusion to the meal. Mrs. Sol, we learned, had arisen early that day, gone marketing to purchase fresh food (the Chinese eschew pre-made and frozen food), and spent the morning cooking. And, yes, genuine Chinese food is delicious. Steamed dumplings. 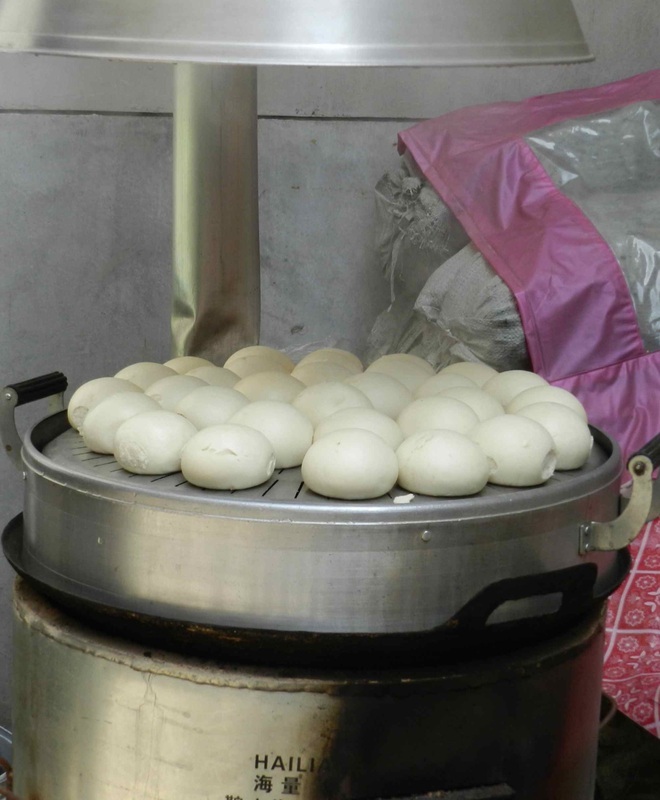 To western eyes, they appear doughy, but they're "baked" (actually steamed) clear through and delicious. A few days later, we visited the home of a family in Xi’an, an area that is benefitting greatly by the influx of tourists attracted by the Terra Cotta Warriors. Our host, a professional chef who had prepared mouth-watering classic steamed dumplings, pointed out happily the he had recently added the covered courtyard and entryway we walked through to enter their home. 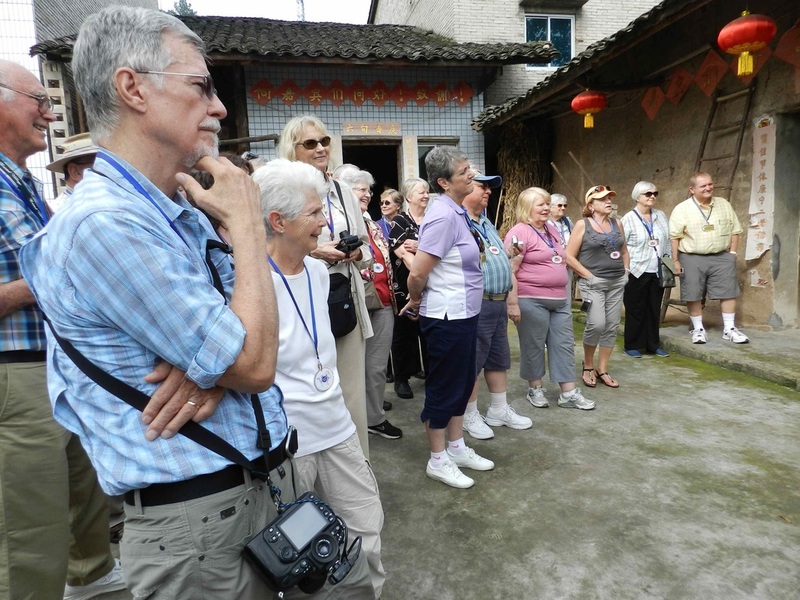 In the meantime, during our Yangtze cruise, we had disembarked at Fengdu for a day trip to a village nearby. There, we visited two more homes which, though smack up against each other, could not have been more different. One was a single-story, four-room, largely windowless adobe which the elderly inhabitants had built when they were first married many years ago; the other, a three-story, 11-room, sparsely furnished modern structure built by a family relocated to make way for the rise of the Yangtze River due to the construction of the Three Gorges Dam. 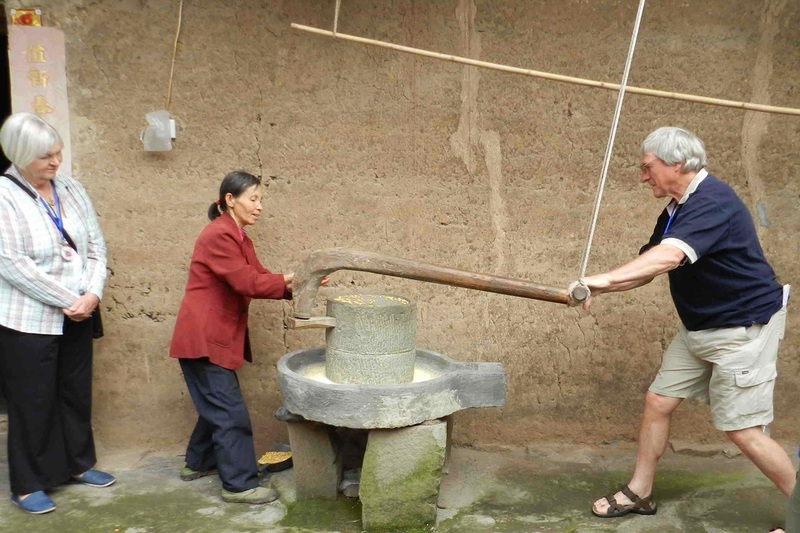 At the first house, we helped Jo grind corn meal on an ancient stone grinder outside her front door. A tiny woman, she made the grinding look easy, but success required a certain rhythm and those of us who tried it discovered it wasn’t nearly as easy as it looked, much to the amusement of our fellow travelers. At the newer house, Mr. Li spoke at length about the process of relocation and the effect it has had on his family. Again, more of those “universals:” He regretted that all his children, preferring to work in the city where wages were higher, all had moved to Chongqing, and he rued the lost contact with long-time friends who had relocated elsewhere. 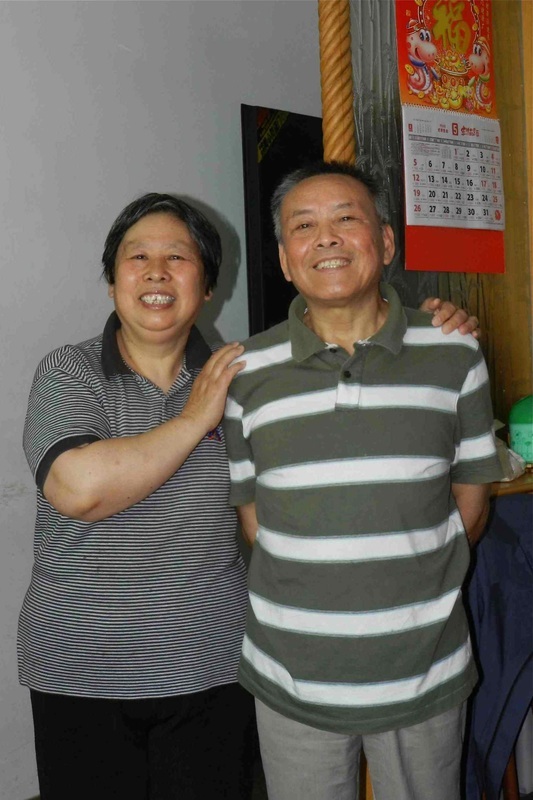 However, he pointed out he and his wife were better off financially and healthier since they no longer drank the Yangtze River water. 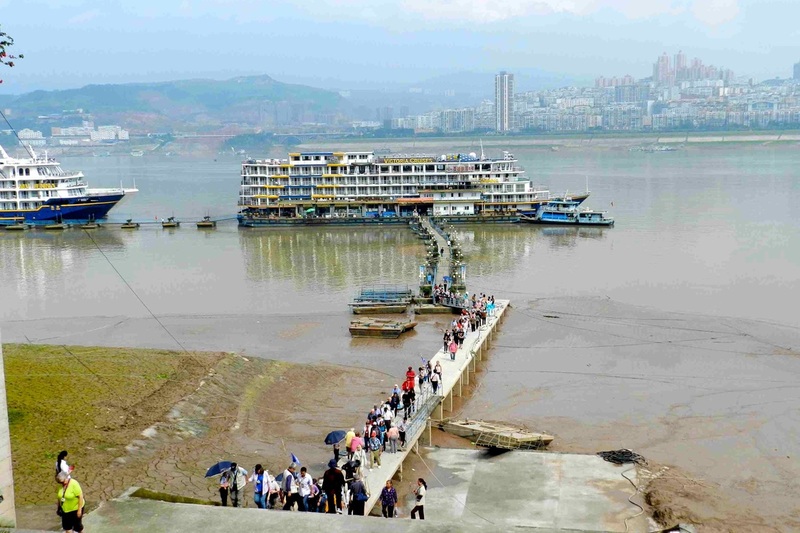 Passengers disembark from our Victoria Cruise Line boat for a brief land tour at Fengdu. 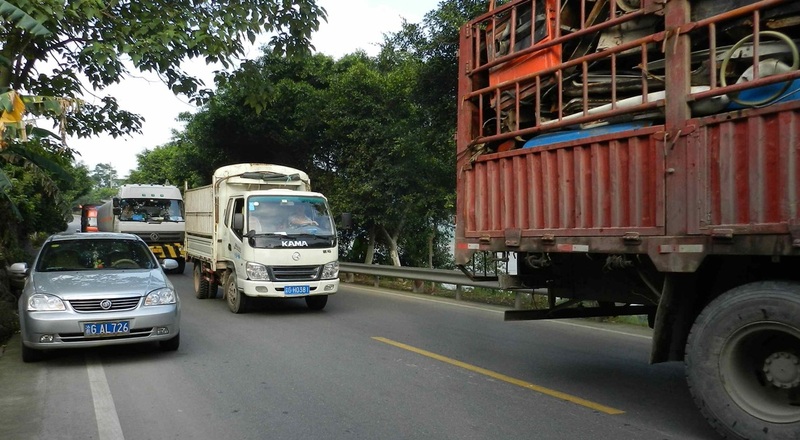 China's safety regulations are much less stringent than those in the U.S. To reach the tour buses, travelers climb many concrete steps without benefit of handrails. 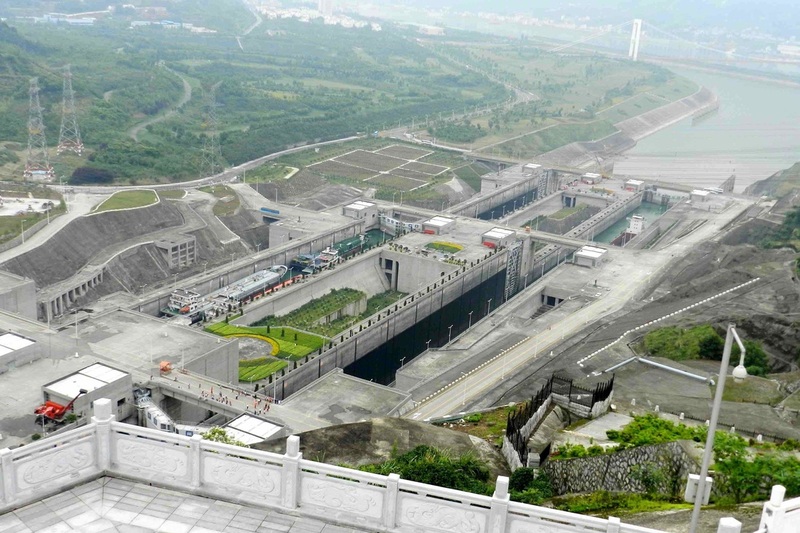 Construction of a "ship lift," an elevator designed to raise and lower passenger ships between the top and bottom of the Three Gorges Dam is ongoing. As usual, the ubiquitous cranes . . . Whether cruising the river or traveling the highways, we soon learned that suburbs seem not to exist. One moment, we’d be passing through open country, dotted occasionally with rural dwellings; the next, we’d pass soaring high-rises packed with apartments. 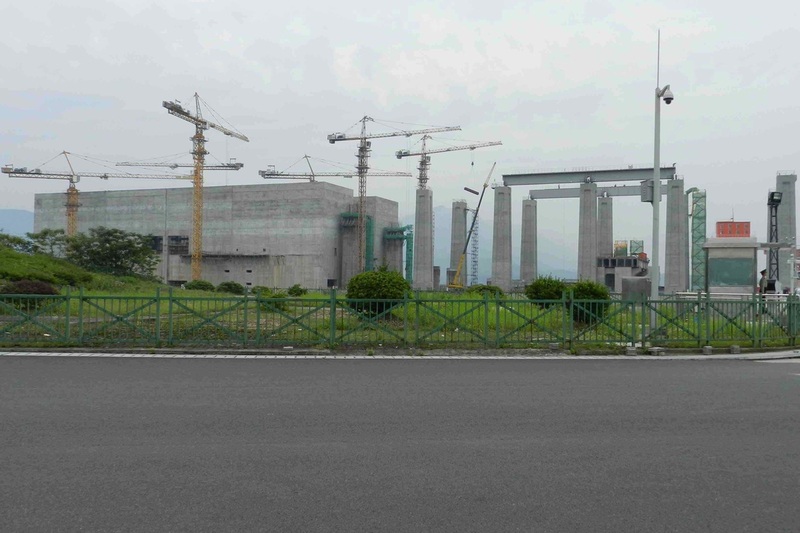 The Chinese joke that the crane is their national bird—crane referring to those contraptions that crown the skyline of every Chinese metropolis, not the bird, as high-rise after high-rise goes up. As anyone who has engaged in group travel knows, your tour guide and traveling companions can make or break the experience, and once again, as had happened on previous journeys, we were blessed not only with an expert, efficient, ever-thoughtful guide, but with compatible fellow travelers from all over the States, Rhode Island to California. While visiting the major attractions was everything we anticipated (well, maybe not exactly; did I mention Victoria Peak in Hong Kong was totally socked in when we stopped there? ), learning about customs, experiencing the unexpected, and sharing impressions with companions greatly enhances the trip. As for the unexpected . . . in Hong Kong the trip had come to an end, but the excitement hadn’t. Several of us had an early morning flight and we’d been told we should rise at 4:30 AM to pick up a boxed breakfast and board the bus for the airport. Before dinner, I phoned the desk and requested a wake-up call. Later that evening, Allen told us that wouldn’t be necessary as he would put in a request for a group call for all those affected. Well . . .we all know about the best-laid plans of mice and men. The order for the group call went awry, but having made our own individual request, we got our call on time. The others, some of whom didn’t awaken ‘til receiving a belated call 10 minutes before our scheduled departure, were scrambling. Nevertheless, we got to the airport with time to spare after yet another unforgettable trip. And, as they say, the rest is history. contact Marj via the "Contact Marj" form on the home page.